Dallas, TX, October 30, 2015–The Southwest Chapter of the ESOP Association celebrated Employee-Ownership Month in the DFW Area on October 30 with its 8th Annual BBQ Cook-off hosted by Vermeer Texas-Louisiana. Congressman and ESOP advocate Pete Sessions of Texas was on hand as a guest judge. A few raindrops didn’t stop a great crowd from turning out to try some tasty BBQ chicken, ribs and brisket. 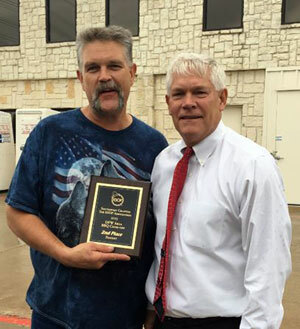 Cisco-Eagle’s own Benny Bruner, took 2nd place with his mouthwatering brisket. Bruner, an ace service technician from our Field Operations division, enjoys being an employee owner by watching how his decisions affect all of Cisco-Eagle. He remarked that “it’s not just a job”. He also smokes a mean brisket!